Are you tired of feeling like you have no control over your life? Are you tired of living a life that doesn't look anything like you had imagined for yourself? Are you tired of being afraid and feeling weak and incapable? Have you always wanted to feel in charge of your life? Do you wish you could take risks without worrying about failing? 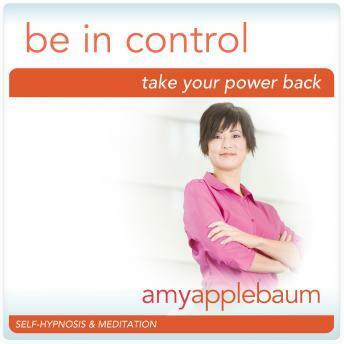 The good news is that you can take control of your destiny starting right now with "Take Your Power Back" from Amy Applebaum. You deserve to be in control of your life and happiness, and hypnosis and meditation can help. Positive suggestions and binaural beats will be received by your mind, removing self-judgment, fear and doubt so that you can take charge of your life and get back to your true self. "Take Your Power Back" helps you overcome fears and emotional blocks that are getting in your way, and replaces them with empowering affirmations and actions so that you can, once an for all, take your power back and live the incredible life you deserve.